My patients well-being is very important to me. My aim is to eliminate their pain and restore them to normal function however I am able. Dr. Tresser is board certified by the American Board of Neurological Surgery specializing in neurosurgery and adult degenerative spine disorders. After graduating, he pursued additional advanced training in neurosurgery and minimally invasive spine surgery. Prior to joining Florida Orthopaedic Institute, Dr. Tresser practiced for 20 years at a private practice in Tampa where he utilized the most advanced surgical techniques including computer assisted navigational surgery and micro neurosurgery. 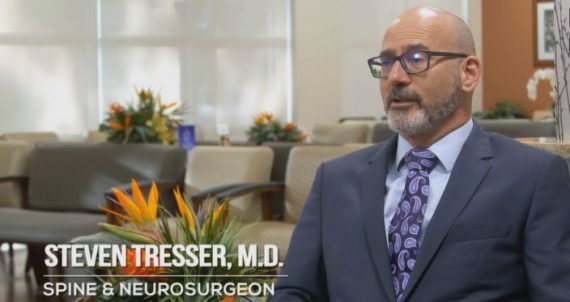 Dr. Tresser offers a full spectrum of neuro services including cranial neurosurgery and focuses on complex spinal surgery encompassing degeneration, deformities and trauma. He also offers patients minimally invasive spine surgery, kyphoplasty, and lumbar spinal injections. In addition to his work in surgery, Dr. Tresser has over 30 years of experience teaching and has been an investigator in multiple research studies. He is a certified Diplomate of the National Medical Board, the American Board of Neurological Surgery, and the American College of Surgeons. Dr. Tresser is currently active in seven professional societies and has won multiple awards, including the Dudley P. Allen Scholar Award from Case Western Reserve University for his distinguished research on neurotransmitter plasticity. In his spare time, Dr. Tresser enjoys photography, sailing, exercise, and craft brewing. Dr. Tresser and his surgical team did an amazing job. We are only a month since my husband’s surgery and he has gone from barely walking to walking more than five miles a day. The entire experience at the hospital from pre-op to post-op was exceptional to say the least. Dr. Tresser was recommended by several doctors as the best neurosurgeon. I was recommended to go to Dr. Tresser by another doctor. I have to say that this man must be the finest of the finest neurosurgeons ever. He is a very talented and successful minimalist. I would do it all over again in a heartbeat! I had no more sciatic pain in my legs when I woke up from anesthesia. I could hardly believe it. I was walking down the hallways without assistance and continued to improve steadily over the next few weeks. I feel just terrific. Thank you, Dr. Tresser! Extremely grateful for the accuracy of assessment and execution of my procedure. Positive results such as steadiness when walking were immediately evident after the laminoplasty performed. Recovery, though challenging, is hopeful and eagerly anticipated thanks to the skill and confidence of this healthcare professional. Thank you Dr. Tresser! I love the care I receive from Dr. Tresser, Charles Procuniar and the rest of the staff. Don’t have any problems with them! I am very happy with Florida Orthopaedic Institute’s services and staff. I have been going to Florida Orthopaedic Institute for different reasons for over ten years. Now, I am seeing Dr. Tresser. He provides me with excellent care, but more importantly he gives me the confidence and puts my mind to rest. Thank you all!! I had a transition to Dr. Tresser when Dr. Billys left the practice. The experience was great! I am very happy with the service I received from Samantha and the staff, they are so nice! Dr. Tresser is a superstar! I underwent a two staged procedure for spinal fusion with interbody cages at 4 levels then 2 days later rod placement for spine curvature. The surgery was very successful and I was taking Tylenol for pain after 2 weeks. I was basically unable to walk any distance without having to sit before surgery…that pain is gone! Thank you Dr. Tresser for your excellent care. I’ve had lower back pain for the last 20 years. In the last 7 years I’ve gotten 4 shots in my back, the first two worked. I had two more in the beginning of the year and it didn’t work. I was sent to see Dr. Tresser and he said I needed surgery (I was scared). Dr. Tresser did an anterior fusion on June 29th, I was supposed to be in the hospital for three days, I got out the day after surgery. It’s been 3 months since my surgery and my back hasn’t felt this good in 20 years.